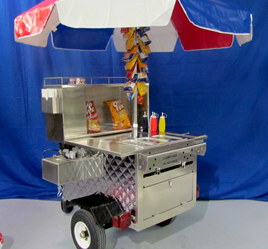 Each cart is built by a skilled tradesman using the highest quality materials, which means nothing less than the best for our customers. These carts are designed to work for you, and most importantly, make you money! We offer continuous support. 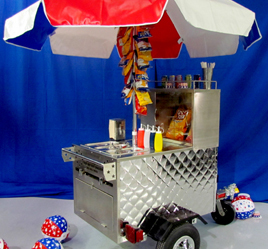 Just because you have received your All American cart, doesn’t mean we’re done doing business. Our team is there to guide you through the process. Don’t know how much supply you need for your first week on the job? Problem lighting your burners on a windy day? Call us 24 hours a day. We know the ins and outs of this unique business and we want you to succeed! 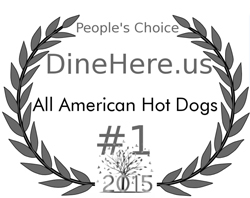 Yes, we are the original hot dog cart manufacturer, but we realize the importance of staying ahead of the trends. 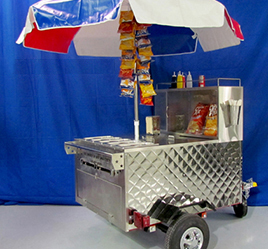 We never forget that a moneymaking hot dog cart is comprised of three components: efficient build, sleek, innovative design, and a hard working operator. 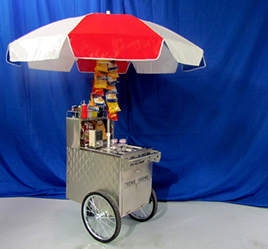 We offer a selection of carts to suit a selection of needs. 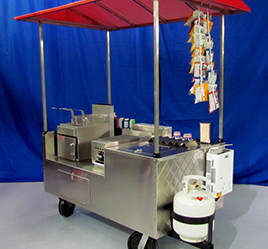 All our carts are built with a sturdy, non-rusting 18 gauge #304 food grade stainless steel. 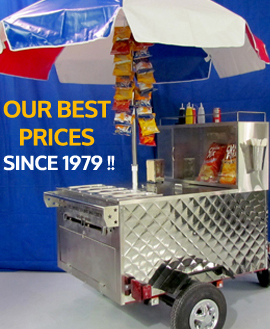 They come equipped with powerful 17,000 BTU burners so that the food you are serving is cooked quickly and to perfection. Our carts are also built with an ample 5-gallon fresh water/ 7-gallon wastewater to make sure you will have enough water supplies to avoid filling your tanks up daily. Each cart is thoroughly and individually inspected before it leaves the shop to make sure everything works when you receive it. All carts are inspected by the craftsmen (or women) and signed. Nothing leaves until it passes all our tests and is signed off.